I commented on somebody else's blog that I think your enjoyment of a play begins to break down after the tenth row. In houses larger than 99 seats, the further you sit beyond that tenth row, the worse the play gets—no matter what the play is and no matter how good it may be. I've seen intense, intimate plays in thousand-seat houses, and it's like whale watching from space. I was at this past Sunday's Pay-What-It's-Worth performance of Mickey Birnbaum's Bleed Rail at The Theatre @ Boston Court in Pasadena (which runs through June 17), and I plopped myself in the front row. Despite the fact that I saw Mickey read his own play at the Bay Area Playwrights Festival artists' retreat two years ago as well as a formal reading with actors at the festival itself, it didn't really register in my brain that the play was set in a slaughterhouse and that things could get messy. There aren't real cows or anything, but the actors are covered in fake blood. With their fake knives, they mime cutting into cows and pulling out their guts. For maximum effect, every time they stab into a cow they thrust forward aggressively and the knives squirt out even more fake blood. 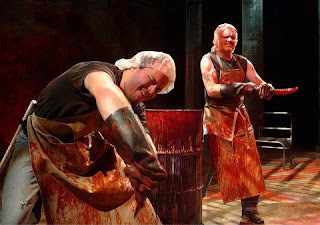 Well, I couldn't even pay attention for the first half of the first slaughterhouse scene because the fake blood kept spilling towards the audience and I was worried that I was going to get bloody. Even Gallagher had the decency to give audience members plastic layers of covering before smashing watermelons on stage, I thought. Alas, fake blood didn't get on anybody, and I damned the heavens because there went my opportunity to get my clothes stained and sue the theater on an episode of The People's Court. The old woman sitting next to me informed me during the intermission that she really didn't care for all the vulgarity in the play. She much preferred the Pasadena Playhouse's production of W. Somerset Maugham's 1926 comedic romp, The Constant Wife. I really didn't know what she was doing at Bleed Rail. The play is vulgar in so many ways—the language, the characters, the situations, the production design. But that's the point. It's almost as if the play is asking—demanding even—that you look through all the vulgarity to find the heart. There's real poetry in the language, the images, the people. Don't let exteriors fool you. I bet even Somerset Maugham would agree.